In the first part of the guide, we took a quick look at how to find the right fit and colour. This week, we’ll be investigating the topic a little further and discovering the ideal style for your frame and which leather jackets you should be avoiding at absolutely all costs. First up, we’re looking at the traditional flying garment worn by airmen in the early part of the twentieth century. The fleece or sheepskin lining was designed to protect pilots from the extreme cold of flying at high altitudes without the luxury of a heated cabin. Obviously, the padding is going to bulk out your frame, so those who aren’t slender should give this one a miss. Although the design hasn’t changed greatly since the original incarnation, it’s best to keep things modern as possible: as I mentioned in part one of the guide, vintage garments tend to be heavy and airless. 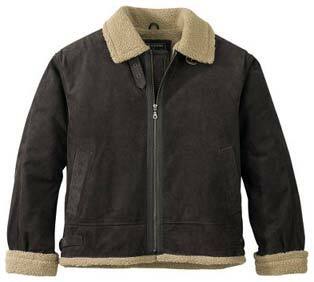 This jacket foregoes the dense lining of the traditional bomber for something lighter and more practical. The design is synonymous with the likes of James Dean, and is one of the more ubiquitous designs found around the high street. 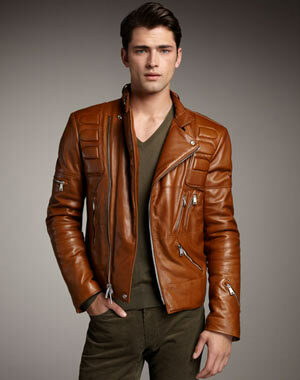 Probably the most versatile of the leather jackets, the style should be carefully considered depending on body type. Skinny, lanky guys should look for an elasticise waistband to cinch below the gut and emphasise the shoulders. Larger guys should shun elastic waistbands and wrist straps; it’ll only call attention to your expanded dimensions. Instead find a regular fit ensuring there’s no extra fabric to swamp your, already more substantial, frame. This jacket was originally designed as all-weather protection for bikers across the globe. Heavy wearing with higher collars, motorcycle jackets tend to feature plenty of zips and pockets for storage and are constructed slightly longer at the back to ensure the garment doesn’t hike up whilst the owner is bent over driving. 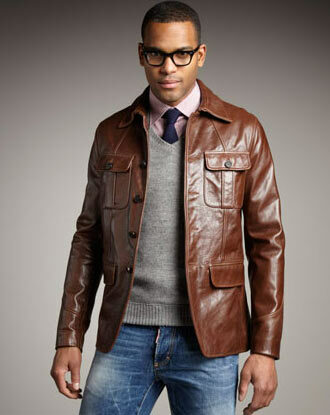 Due to all the visual breaks in the jacket (zips, pockets, protective padding lines, etc) shorter men may want to avoid this style. On the other hand, tall guys can enjoy the volume and added depth this extra decoration will create. Remember, unless you actually ride a motorbike, you should stick to the ‘fashion label’ jackets and vice versa. Biker ‘leathers’ offer considerable protection to riders on the road, whereas their informal ‘chic’ counterparts don’t. 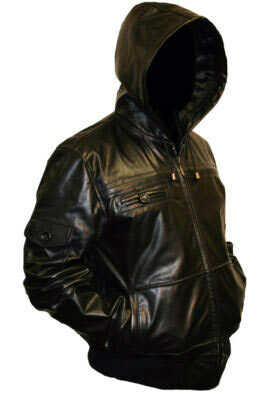 A relatively new addition to the collection, the leather ‘hoodie’ definitely gives you a masculine edge. That being said, it’s not necessarily one for the older generations, who may find the youthful vibe too much for their tastes. 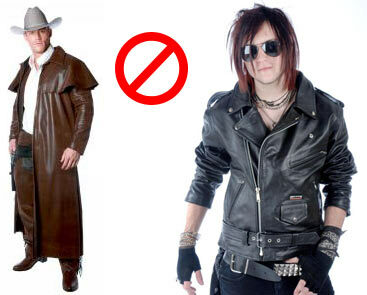 Leather Trench Coat – All the heavy, flapping material will look incredibly shapeless and swamp even the most robust of frames. Unless you’re an ‘Old West Cowbody’, the duster certainly shouldn’t be your first port of call. Punk Leather Jacket – If you’re a signed up member of the movement feel free to rock it like Joey Ramone, Otherwise, stay well clear of this chaotic, hard-edged look. Johnathan Bell is the founder, owner and main author of Guy Style Guide, a website dedicated to everyday male fashion, style and grooming. The primary mission? To guide clueless men through the tricky mindfield that is the growing world of male couture. Find him on Google+, Twitter and Tumblr. Well, I’m 5’6″ “tall,” maybe 10 pounds overweight, gray haired, and it seems you recommended nothing for me in the leather jacket department. I’d like some guidance…PLZ! © 2014 - GuyStyleGuide. All rights reserved.